Fall is definitely in the air in Toronto, and the concert season is off to a great start. Wednesday night the Toronto Symphony Orchestra presented on of the most beloved works in the orchestral canon: Mahler’s 3rd Symphony, in the, what I like to call, brutalist architecture of Roy Thomson Hall. You know you’re in for a ride when you walk in the hall and there are 8 horns, 4 trumpets, 4 trombones, and a tuba on stage for your orchestra concert - oh, and two harps and at least five percussionists all seated in front of exposed concrete which you know is going to do some serious reverberatory work. Despite unleashing the full cavalry on us, the TSO brought some highly nuanced music making. The fortississimi were the definition of epic alongside pianississimi that were delicate enough to hear a pin drop. The piece is a sort of tone poem (I say sort of because in the middle of the second half we get actual poetry) telling the story of the world’s creation through the eyes of Pan, the mythological faun. The first half, which was composed after the second, serves as an introduction to the four-part second movement, which sonically told the story of Pan coming to consciousness and discovering the wild world around him, culminating in a Dionysian procession. I know I often talk about the immense amount of amazingly talented singers, but I want to go on record and say it applies to all musicians - and last night was proof positive of that. That being said, this was Mahler, so the night belonged to the brass. 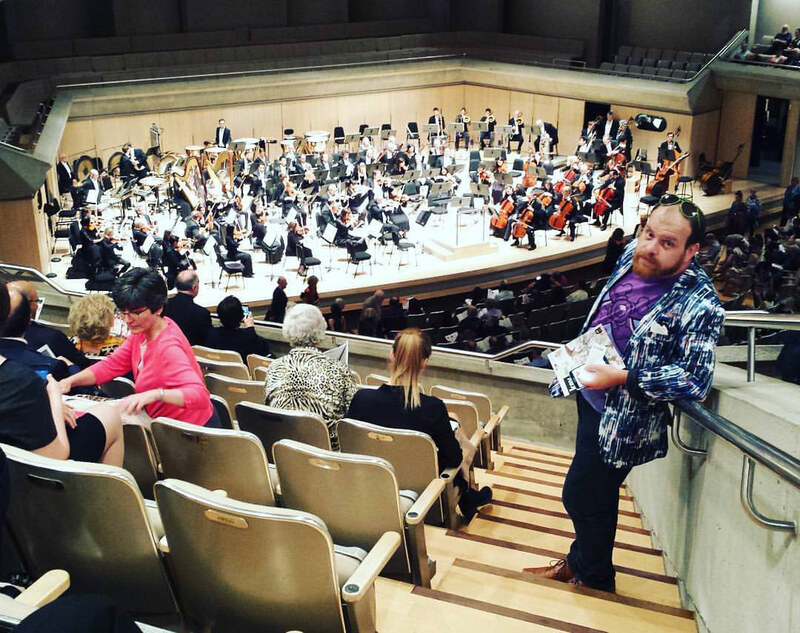 Contributor Greg Finney at Roy Thomson Hall. Photo by Malcolm Vella. After intermission, we all settled in for the second movement. Part Two - which Mahler titled “What the flowers of the meadow tell me” - was almost Mozartian in its delivery. String-heavy and lilting, it delivered a pastoral image of wilderness and nature springing to life. Part Three, “What the animals of the wood tell me,” marked deft use of the remarkable woodwind section to depict the frolicking and playfulness of the animals found in nature. Mahler’s orchestration of the moment, when an offstage horn can be heard signaling the arrival of a new, bizarre animal (man), was brilliantly executed and showed trumpeter Andrew McCandless’s beauty of tone and skill at passing through the wide range Mahler prescribed. And then Part Four - “What mankind tells me.” Anyone who hasn’t heard Jamie Barton sing is missing out. Barton’s voice is incredible. There’s a lightness blended with power that’s perfect for song/concert singing. I remember my voice teacher in my undergrad (Hi, Marie!) telling me, “they aren’t paying to see the work,” and last night was the lesson I needed 15 years ago. Her tone was flawless, the sound was effortless and she magically wove her way in and out of the orchestral colour in a way that I’ve seen very few singers pull off. It was breathtaking. In Part Five, “What the angels tell me,” Barton was joined by the combined forces of the women of both the Amadeus Choir and the Elmer Iseler Singers, Oriana Women’s Choir and the Toronto Children’s Chorus. This passage is considerably spritelier than the previous ones. Rhythmic and folky in its sound, it shows off the chorus’s skill at balancing their sound against a huge orchestra and a single solo singer. Part Six, “What love tells me,” is exactly what you hope for in a Mahler. Lush orchestrations, massive changes and swings in dynamics, and the TSO has all this in spades. Not to mention some of the most devilishly quick passages for everyone in the coda. Bravo. Shout out to Andrew McCandless on trumpet, Neil Deland on horn, and Gordon Wolfe on trombone. This was some of the most skillful brass playing I’ve heard in a long time.